Lorenzo Mateo Francisco, a member of the community news agency Prensa Comunitaria and the coordinator of the Snuq’ Jolom Konob’ community radio station in Santa Eulalia, will speak about the importance of and repression against community journalism in Guatemala. Lorenzo is also an indigenous leader and will share information about local resistance movements, as well as the criminalization of community leaders from his region. GHRC will accompany Lorenzo on a speaking tour in the Midwest and on the East Coast of the US from November 1-15. 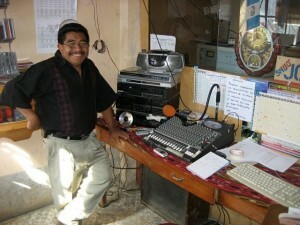 Lorenzo Mateo is a Q’anjob’al indigenous leader, a member of Prensa Comunitaria, and the current coordinator of the Snuq’ Jolom Konob’ community radio station in Santa Eulalia, Huehuetenango. In Guatemala — especially in rural areas — community radio is an important, low-cost method for sharing information, and community radio stations make up an important part of the Prensa Comunitaria news network. In indigenous communities, the stations are also used as a tool to help preserve culture and language, to defend community rights, and to engage in national debates. Lorenzo has been involved with the Snuq’ Jolom Konob’ station for 12 years, initially as a volunteer and now as the station’s primary coordinator and as a member of its Board of Directors. The station, founded in 1999 and broadcasting in both Spanish and Q’anjob’al, has publicized important information on planned hydroelectric projects in the areas as well as corruption of local authorities. For this reason, it has also been a target of repression and attacks, and was illegally closed down in March 2015. Lorenzo, who has also received threats for his work, has been integral in seeking out support for the station and legal recourse to challenge its closure. Although the station is now broadcasting again online, its headquarters in Santa Eulalia remain shut down. As an indigenous leader, Lorenzo also serves as a member of his area’s “Committee for Community Development.” He has been involved in efforts to preserve the Q’anjob’al language by participating in workshops on Mayan languages and contributing to a project to translate Guatemala’s constitution from Spanish into Q’anjob’al. 5:00-6:30 PM – Public event at Oberlin College, organized by the Oberlin Students in Solidarity with Guatemala.